I hated cauliflower with a passion until I was in my 20s. Why? I don’t really know. Maybe it was the smell as they were cooking or how they looked. Now? Love it. I can’t get enough cauliflower and use it often in recipes. Isn’t it funny how tastes change as you age? 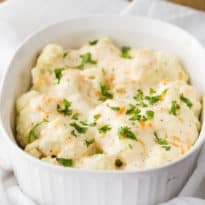 This Creamy Cauliflower is an easy side dish with a flavourful sauce that makes it more palatable for those picky eaters. It tastes even better heated up the next day for leftovers. The Dijon mustard is a powerful addition to this creamy sauce. If you aren’t a fan of the strong flavour, use less of it or simply omit it. I love Dijon mustard so I said the more, the merrier! We served it with some baked chicken. It would also make a wonderful side to your Thanksgiving dinner. Hopefully, it will entice some picky eaters to try it and maybe even to convert them to cauliflower fans. What are your thoughts on cauliflower? Love it, hate it or meh? You might also like this Keto Cauliflower Ziti. Packed full of mouthwatering flavour! It tastes even better heated up the next day for leftovers. Preheat oven to 375F. Bake cauliflower on a baking sheet for 10 minutes. While baking, stir together the rest of the ingredients in a bowl. Transfer cauliflower to a casserole dish. Pour sauce over top. Bake for another 10 minutes or until cauliflower has reached desired tenderness. Serve hot. Yum! This looks like an awesome quick and easy side dish! 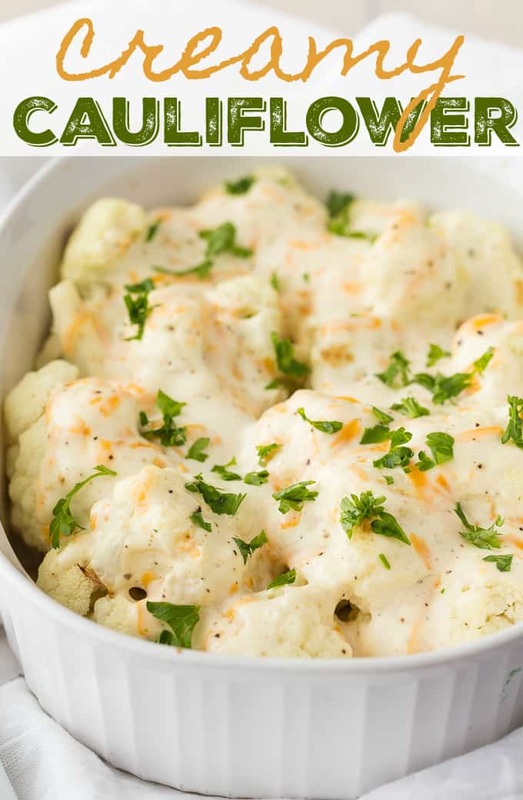 Oh my goodness, I love cauliflower and this looks so good. It is funny but I actually bought a head of cauliflower today and now I am going to try this tomorrow! I’m kind of excited. I will have to let you know how it turns out. Oh, this definitely has my name written ALL OVER IT! Bookmarking! I’m trying it this weekend. I love the idea of your creamy cauliflower, it looks delicious! Thanks so much for sharing with us at Full Plate Thursday. Have a great weekend and come back to see us real soon! It’s a rainy day here in Massachusetts and I could totally go for this right now! Your cauliflower looks so good, I could dive in!! Thank you for sharing on Oh My Heartsie Girls WW!! We have pinned and we will be featuring your recipe this week! Come see us again, soon! Wow, that looks so good! Unlike you, I’ve always liked cauliflower, but usually eat in steamed. This is a really nice alternative. I like that the recipe looks simple and easy too. You can’t go wrong with Dijon mustard or cheese as an ingredient. My mom used to make a dish very similar to this when I was a kid. I haven’t had it in years! Thanks for sharing with Merry Monday this week. I’ve never seen a recipe like this but I love doing recipes like this with a sauce. yummy !! !